Jeremy Piven was nearly 40 when he got the role of a lifetime—super-agent Ari Gold on Entourage—so you might assume he knows something about the midlife questioning that afflicts his character in Mark Pellington’s dark, strange I Melt With You. But over mid-afternoon eggs at a deli near his Manhattan home, he rebuffed the idea of more than a superficial connection, while at the same time making his personal attachment to this new movie abundantly clear. After seven years on Entourage, Piven knows a thing or two about career management, which is likely why his first two movies after the show’s finale are leagues apart—unless there’s some connection between a larcenous financial manager and the villain in the fourth Spy Kids movie that isn’t immediately clear. Piven can be a prickly interview subject, bristling at the (misread) suggestion that he’ll have trouble getting people to see him as anything but Ari Gold, but he’s nothing if not sincere about his craft, the product of an upbringing steeped in devotion to the stage. 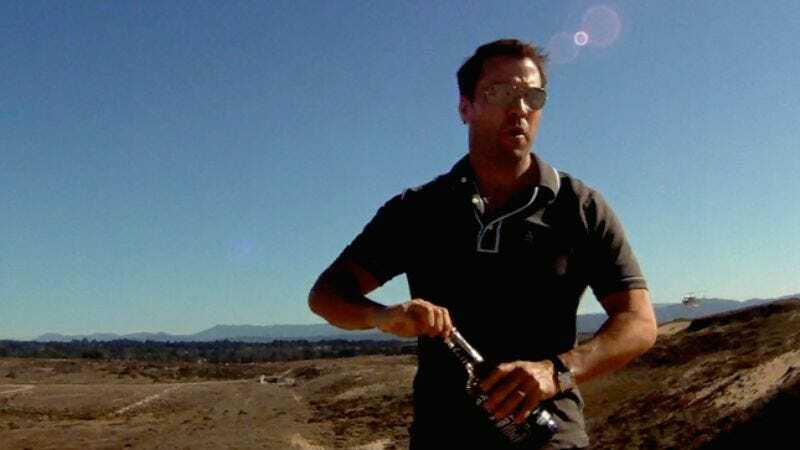 Piven talked to The A.V. Club about the I Melt With You’s “polarizing” plot twists, his years of playing sidekick to better-known actors, and the unlikely staying power of PCU. The A.V. Club: You did press for I Melt With You at Sundance, and you’re doing it again now. Do you feel a special commitment to this project? Jeremy Piven: I do. It certainly shows men relating—or not relating—to each other in ways that I have not seen on film. And in that way I thought it was really unique. It’s a very polarizing movie, and that’s kind of fun. My character’s storyline is similar to Bernie Madoff’s, even though he’s younger, in the way that he played with people’s money and their lives and ruined his own and his family’s. The Bernie Madoffs of the world, their third act is not available to us, so my character, Ron, I thought was a really interesting guy to explore. He’s defined himself by the money he makes as a provider and he represents greed. All of us are all kind of making up the parts of a whole man. I’m the greed, Rob Lowe is the medicine, Thomas Jane is the art, and Christian McKay is the feminine side. We’re all different parts of a whole in a weird way. I hadn’t played a guy who had a journey like that ever in my life. As an actor you want to explore something you haven’t done. AVC: Mark Pellington talked about the four characters being parts of a whole. Did he let you in on that idea when you were making the film? JP: He’s one of these guys who sets the tone of the movie by playing a lot of music on set that inspired him and that was going to be used in the movie, whether it’s The Clash or whatever. He’s really great for actors in that way. But as far as going really deeply into psychologically what the characters represent and all that kind of stuff, we didn’t go into it extensively. It was more like we were thrown into the fire, and I think that was a good method. It ultimately, as you know, ends up going very dark, and you don’t want to hang out in the belly of the beast for too long. AVC: Your characters are introduced with title cards giving their names and ages, which are obviously close to those of the actors playing them. Did something about being at that point in your life speak to you as well? JP: I think that this country, more than any other country, is very obsessed with age. A lot of people are ageists, and maybe obsessed with how people are achieving things at a young age. I think there’s a tendency to be very distracted by that. But as an actor, we’re lucky enough to do what we love to do and stay connected to that in a weird way that keeps you young. My mother was my acting teacher since I was 8 years old, and she’s still teaching and directing and just wrote a book on acting. I think that keeps you very vital and young. At this moment—maybe I’m in total denial, which is possible— I’m just not letting myself get caught up in that kind of classic mid-life-crisis thing. I guess that’s a long-winded way of saying I’m not going through what my character is going through. AVC: Did you talk to Mark Pellington a lot beforehand? There’s almost a No Exit quality to the four of them being holed up in this vacation house, which gives it a kind of abstract or disassociated quality. Was it a matter of just showing up on set and seeing where things fell? JP: Yeah. The beauty of it and also the fun challenge of it is to create a history with these people and to trust it and to hit the ground running. It very much is like one of those plays where there is no exit, no way to escape. I think that’s one of the reasons why he picked Big Sur, because it opens it up and makes it so expansive that the audience can breathe. I think that was very kind of Mark. AVC: As you said, there are people who viscerally dislike the movie. They don’t like being trapped with these guys. As they keep drinking and doing drugs, they become increasingly difficult to be around. JP: These are guys who medicate themselves because they obviously don’t want to face themselves and each other, because facing yourself is not an easy thing to do. For an audience to face people who don’t want to face themselves may not be so easy either. But if the work is done and these characters are authentic and you don’t like them, that in itself is a victory. It’s not like we’re celebrating this behavior, clearly. So you might want to stick around for more than 10 minutes. AVC: What do you make of the idea of a 44-year-old holding himself to a promise he made when he was 22? Most people’s lives don’t turn out as they thought they would, but then most of the things 22-year-olds expect turn out to be kind of stupid. JP: In that way, I think my character was very similar to you, in that he’s the voice of the audience. He says, “We’re not the same people. We’re not the same guys.” Other circumstances in his life have led him to joining in the pact with the other guys. He doesn’t have the same ideology as the rest of them, he just can’t face his family. AVC: It might just be the wardrobe or the tax bracket, but there’s at least a superficial similarity between Ron in I Melt With You and Ari Gold on Entourage. Did it strike you that way? JP: Yeah, sure. They’re not necessarily cut from the same cloth, but they both have a similar drive to be earners and all of that stuff. He’s brought to his knees in a way that Ari Gold would never be, and that territory was something I hadn’t explored on that show. AVC: Having played a character as long and with as much success as Ari Gold, is it hard for you to step out of that shadow? How is that sitting with you? JP: It doesn’t actually sit with me. It might sit with you, and it might sit with those who collect statistics and break things down and compartmentalize things and profile things and sit in dark rooms in their boxers and pontificate—I don’t know, I don’t know. The reality is that I’m an actor from the Midwest and I was 40 movies into it before I started Entourage. I could have been very much classified as the schlumpy best friend, the ne’er-do-well buddy to Nicolas Cage or John Cusack. The “plus one” if you will, okay? I could’ve very easily been seen as a guy who would never in a million years have the chops to play a character who could take all the oxygen in the room and be a reactive, power-hungry character like Ari Gold. I don’t know what the variable is in terms of why this character struck such a chord. I had done various characters that were completely emotionally invested onstage in Chicago for decades. I was lucky enough to play a character called Methuselah that made Ari Gold look like a Boy Scout. I was head-to-toe outfitted in fat pads; people thought my father was playing the role, who is also an actor. That was by far the greatest role I have ever played, and the 200 people a night who saw it, that was fun. The reality is that my resting state is probably the antithesis of Ari Gold as a human being, so to be typecast as something I had to whip myself into a frenzy to play is interesting to me as a concept, but it doesn’t intimidate me as an artist because there are other characters that are so much closer to me. When I did Neal LaBute’s Fat Pig, I played an everyman who couldn’t honor his love for this woman. I remember people saying, “How did he pull that off? It’s a magic trick!” It’s like, “Well, no. This character is closer to me than the others.” But you can’t tell people that. And by the way, who cares? So you just proceed and have fun and if people only want to see you as that character, then that’s their prerogative, but it’s your duty to inhabit other characters and keep swinging away. AVC: I meant less stepping away from Ari Gold in terms of public perception, and more in personal or artistic terms. Entourage was a huge part of your life, and a character that you played for longer than any stage actor ever would. It has to be quite an adjustment to step away from that. JP: I guess that would be the fact for any role, whether it be film or TV. Obviously, TV is in people’s living rooms, so it’s more of an intimate exchange. If you strike the right chord and it’s authentic, then you’re faced with this problem. It’s hard to try to theorize about emerging form the shadow of that character, but I really look forward to—I’ve got three movies coming out and I’m exploring other things so that I can be typecast again very soon. AVC: As you mentioned, you come from an established theatre family in Chicago. Your parents run the Piven Theater Workshop, whose graduates also include John and Joan Cusack, Aidan Quinn, and Lili Taylor. Was there a point at which you wanted to do anything but acting? JP: When I was growing up, I was always on stage but I loved other things. When you’re younger, you’re rebellious against it simply because your family does it. Then one day you get the perspective that not every family has their kids get up and do Chekhov short stories and Salinger and do improv from the time you’re 8-years-old. I thought everyone’s parents were artists. When you’re little you live in a microcosm. I remember being in college and being a freshman and my parents coming to see me. As a freshman I did Julius Caesar and I played Mark Antony, and they were very supportive. It was a turning point for me, because it was the first time I worked outside of their theater, so they, for the first time, said, “Yeah, we really think you should do this.” That was a very heavy moment, and I’ll never forget it. It was very empowering because they’d never mentioned it, even though for 10 straight years I was working with them. So it was really heavy and encouraging and I think everyone needs that encouragement. AVC: Was it the fact that you were doing something totally apart from them for the first time that prompted them to give you that validation? JP: Oh, yeah, without a doubt. Like I said, they’d never said anything about it until then. Making it outside of them, taking the training wheels off, that’s a major turning point. I think I got the Fresh Face Award, some award, when I was in my late 30s. I thought, “My face isn’t very fresh.” I was this kind of overnight success in my mid-to-late 30s after doing it since I was 8, which is always interesting. Everyone’s journey is completely different. I think we’re living in times where a lot of high-profile people in this culture are reality stars. It’s a very strange time right now. I was lucky enough to apprentice this job, and I have a great deal of respect for it and the space you occupy to do it. I try as hard as I possibly can—sometimes too hard, possibly. But that’s okay. It’s all part of it. I leave it all on the field—these are all very clichéd statements. But I think there understandably is a generation right now that doesn’t have a lot of examples of apprenticing things, and people go, “Where’s mine? Why can’t I be a superstar?” That’s the culture right now. AVC: It’s interesting how people come to different points in their career. But even as a “plus one,” as John Cusack’s buddy in Grosse Pointe Blank or Say Anything, you made a real impression. JP: Yeah. Grosse Point Blank is one of those rare dark comedies. Those are hard to pull off and that achieves it, I believe. It stands the test of time and you need a new definition for what this is. A darker, dark, dark comedy. Blue-black. JP: Yeah. An existential horror movie. The real Hangover. AVC: I Melt With You is one of the rare movies that genuinely surprises you. It’s impossible to know where it’s going until it’s halfway over. JP: It is tough. I was doing radio interviews this morning and it was like [nasal radio-guy voice], “What is this—a movie or a TV show? Tell me a little about I Melt With You.” It’s dawn and you’re just like, “Wow, I’ve gotta sell the metal and it’s dawn and I can’t give it away.” It’s a morning-drive moment and I’ve gotta crystallize this thing. It was definitely the toughest moment—I’ve been improvising since I was a kid and that was a hard one to work my way out of. You can’t give away too much. How do you describe what this movie is? In that way it’s kind of cool, because it’s not derivative of anything else. I saw people see it the other night and an older guy said it reminded him of Cassavetes’ days in the ’70s. It’s like, wow, I would never say that and of course those guys are our heroes and that was genius; we just grabbed some cameras and went to Big Sur and did something. But that was his reference, and there are a lot of people today who don’t have a reference for Cassavetes’ stuff. It isn’t derivative of anything, so it’s fairly unique and you don’t get a lot of that. It would have been easy to wrap it up and let you off the hook but it doesn’t. And that’s pretty cool. AVC: One of the nice things about being a critic is sometimes you get to show up in a theater knowing almost nothing about the movie you’re about to see. It’s very rare for people to go in cold these days. JP: Wow. No expectations, it’s just a blank canvas. This movie, I think there are some things that you should know about it, some variables in the experience, which are: We made it for nothing, we shot it on Canon 5D’s, it was done for half a million dollars, it was shot in two weeks, no one made any money, we brought our own wardrobe, there were no trailers, we did it for love of the game, we’re all huddled together on the floor eating off paper plates and running into the set, and we had the time of our lives. It’s the antithesis of what someone might think the Entourage experience was or the world it depicts. But, by the way, that was always my experience. I never made more than $50 doing any play in Chicago. That was the way I grew up. It wasn’t like, “How am I going to do this?” It was like, “Oh cool. I’m going back to this. This is awesome. Let’s get into it!” What I wanted this movie to do is inspire people to make their own movies, because you can find that money to make movies. This movie a studio wouldn’t make—that’s a reality. So Mark Pellington wanted to make it and we had to work for nothing and we had to all love it. If nothing else, you have to at least celebrate the spirit in which it was made. I hope people take that and go and make their own movies. That’s what’s happening in other arenas. In the music industry, singer-songwriters—would Mumford And Sons have blown up like this 10 years ago? I don’t know. Would they have knocked Debbie Gibson off the charts 10 years ago? I don’t know. Auto-Tune is peaking, I don’t know. Times are different and this is a way for people to go and find an audience for their work. AVC: It seems similar to working with Robert Rodriguez on Spy Kids 4, in that Troublemaker Studios is very much a self-contained proposition. It’s like making a movie in his house, only it’s a really big house. If not sitting on the floor eating off a paper plate, people just show up and work. JP: Well, he has that energy. Rodriguez has figured out how to do it himself and he created a studio which is his playground and his backyard there in Texas. He gets all the toys and the bells and whistles to make his dreams come true. He’s a genius and has a boundless imagination and I was lucky enough to work for him. That’s different, because he’s got the green screen and everything. The imagination is that same vibe, which is, “I’ve got a barn, let’s do something.” This particular filmmaking, literally, it’s you’ve got between 2,500 and 45 grand, some Canon 5D and 7D cameras, you can go and get it done. That isn’t to say that our DP isn’t a genius, because he is, and it looked great. You wouldn’t know that movie was made for that. He made it look incredible. AVC: You could make a movie with that, even if you couldn’t make this movie. JP: No, you could, but you need people who are genuine artists. Mark Pellington shot the “Jeremy” video a million years ago, and U2. He was a pioneer in certain ways. You gotta have a guy leading the charge who knows what he’s doing. So, no, I’m not just saying you can give the camera to your aunt and just have her shooting video of you in the shower and then try to get it into festivals. AVC: I asked The A.V. Club’s readers if they had questions for you, and the overwhelming majority of responses had something to do with PCU. JP: Wow. I’m blown away by that. It was trending on Twitter the other day, and I put “I love a late rally.” It was one of those movies where I think those guys were ahead of their time and they wrote a really great, fun movie. As you know, it’s tough with studios. They can get behind something and you’re off to the races, or not. I did a movie called The Goods with Will Ferrell. I think that will be one of those cult movies, I really do. I’m really proud to be a part of those. Serendipity, Grosse Point Blank, I think those things will be around. PCU was a blast. I was in the middle of shooting The Larry Sanders Show, I was in my late 20s, I was living the dream. Today you’ve got the Weinsteins, you’ve got a lot of guys who know how to put movies out and they’ll take something that Tarantino or Guy Ritchie does and they’ll make it accessible. I think you would probably reach a great audience today with something like Grosse Point Blank. AVC: Grosse Pointe Blank seemed like something the studio had no idea what to do with. JP: That’s one thing you learn as an actor. Those things are all out of your control. You love them while you’re doing them and do everything you can to get them out into the universe. Like an audition. My dad gave me this great advice: “Once the audition is over, the audition’s actually your job, and then your job is done.” And you can’t go back like, “How did I do? What’s going on? How can I improve?” No, the scene is done, you have to move on. AVC: I Melt With You is opening in a small number of theaters, but most people will see it on-demand or on DVD. JP: They’re doing it on-demand, and iTunes, and Apple TV and all that stuff. I think it’s a good idea for this movie. A lot of people are checking it out, which is really cool. It’s just a new way to put movies out and for a studio to see that people are interested, and that actually changes the trajectory of the theatrical release. Right now it’s at the Quad here, and it’s at the Nuart in L.A., and it’s already made its money back on-demand in a couple of weeks. They say, “People are really digging this, let’s expand.” That’s how things change. Before, things were a little more blind, like, “How did it open? Was it number one? Let’s pull it!” I’m cautiously optimistic about the whole thing.